When we first heard about Seafoam, we look at the list of it’s promised benefits and wondered the above question. Does it really work? Seafoam claims to be able to prolong engine life, clean internal engine components, and passageways and be totally safe in any quantity. What is Seafoam made of? What is the white smoke coming from the tailpipe? Will Sea Foam fix this problem? How do I use Sea Foam? Do you use Seafoam personally? Where can I find proof that Sea Foam works? Do you recommend Sea Foam? The solvents in the product soften and dissolve fuel combustion by-product build-ups, such as soot deposits. When used in the intake passageways, they will dislodge built up carbon matter and this is then burned up in the combustion process. The alcohol acts as a solvent too, but also works as a fuel stabilizer and water absorbing solution (hygroscopic). The alcohol will also boost octane levels, increasing power and making the engine sound “smoother” or less noisy. It is often claimed by YouTube reviewers that white smoke that comes from the muffler is burning carbon. However, it is likely that this is actually the Sea Foam oil heating up and smoking. No, the chemicals used to make Seafoam additive are safe to be used inside an engine and will not damage internal seals or rubber gaskets. The solution is burnt up in the combustion process. The Seafoam website says that it isn’t possible to add too much! We’ve found no evidence online of anyone refuting this claim. Using Seafoam twice a year or before fuel filter changes make it an economical addition to your car maintenance procedure. If you suspect your vehicle has a mechanical problem, you should consult a mechanic. Sea Foam cannot repair internal damage to bores, cracks in cylinder heads or leaking head gaskets. 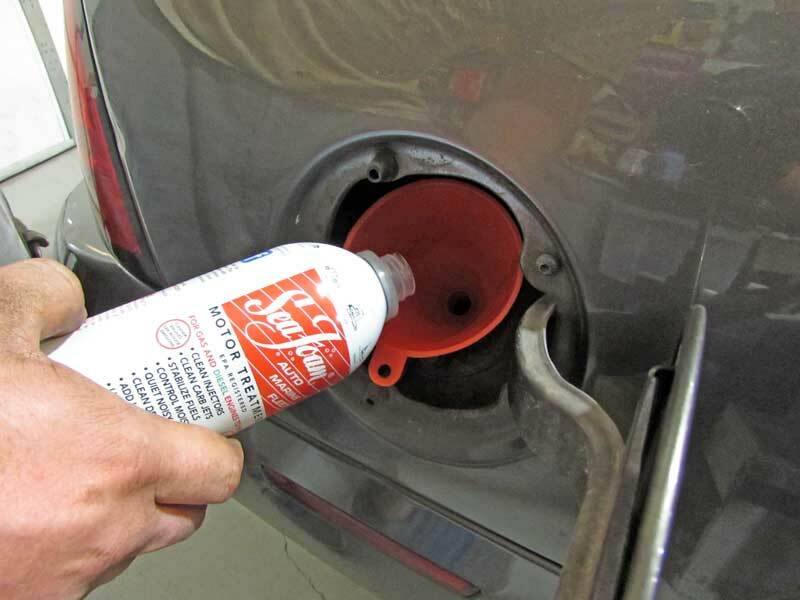 Sea Foam can be used as a fuel additive and will help prevent diesel fuel from gelling in low temperatures. It will also add lubricity to the fuel. It can also be added straight into the crankcase oil, before an oil change. This is supposed to remove built-up soot and waste deposits. On gasoline engines only, Sea Foam can be sprayed into the air intake or poured into the carburetor slowly. Over the years, we used many fuel additive and engine cleaning products. Sea Foam is an excellent option amongst many. If possible, we choose to use Sea Foam. Using Seafoam as part of a regular maintenance program will help to reduce corrosion from moisture, carbon build-ups, and restricted airflow. It could very well increase engine life. This YouTube user demonstrates the use of Sea Foam on a Two Stroke mower engine. Using a borescope, the video maker is able to show a before and after of the cylinder bore. He repeats the process several times, each time, the piston is noticeably cleaner. Yes, we use Seafoam on our own vehicles and do not mind spending a little more on a product that delivers an excellent result, in this case, that’s a clean running engine! It certainly seems comparable to other fuel additives and injector cleaners. The added benefit of Sea Foam is that it can be used in so many different ways! Definitely, one to try for yourself, whether that be in your diesel engined vehicle, gasoline-powered car or a 2 stroke mower engine.